Angraecoid and Aerangis orchids are Vandaceous orchids from tropical Africa and Madagascar. An epiphytic orchid these are not a really common genus, but they are lovely. Like many epiphytic orchids they require a strong filtered light and some humidity. They do appreciate a little misting 3 – 4 times a week. It is interesting how the name is derived from the Greek aer, meaning air and angos, meaning vessel, a strong hint at to how they grow. One of the major factors in growing the species is consistency of temperature, they do not like big changes. However as different species come from different altitudes their requirements will differ from species to species. 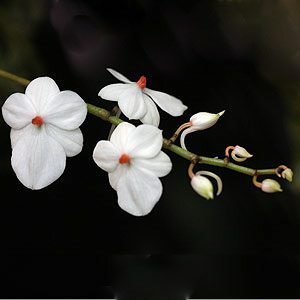 All species like good filtered light rather than direct sun, and all can be grown either as mounted specimens or in orchid baskets in a medium to fine pine bark. We particularly like Aerangis luteo alba (see picture right) and the variety pictured is Aerangis luteo alba var. rhodosticta, an epiphytic orchid from Kenya. The lovely orange to red centres really stand out. Fragrance is mild with more intensity at night. This is a miniature species and one of the most desirable forms. Aerangis citrata flowers from summer through to autumn, white flowers trail in long bracts and are fragrant with a pleasant lemon scent. Aerangis modesta is similar to above. A, fastuosa is the species that we find fascinating. Lovely large white flowers and large green leaves.